Let me tell you how it all started at Penn. It was back when I was a sophomore, before there was any such thing as 'Heart to Heart' (nor 'Chazan Ish'). Chanukah was approaching, as were finals, and all the studying was starting to make me antsy. So my roommates and I, looking for some fun, decided that we would go on a singing expedition - Chanukah caroling in the Quad. The Quad is where most of the freshmen live, including a few religious freshmen who we knew. After a little research, we found out where a few of our freshmen friends lived and we set off. The talented singers that we are, we didn't need much practice ("I got high, you got melody and you got low") and we came to our first destination. We knocked on his door, and when he opened it, we broke into "Maoz Tzur" and our very own "We Wish You a Happy Chanukah". To our utter delight, he said he thoroughly enjoyed it and was very appreciative for a break in his studying. We then asked where the next religious person who we knew lived and he directed us down the hall. When we got to our next stop, the same thing happened, we sang the same songs, and the girl was equally pleased. Then, a girl from across the hall opened her door and stepped into the hallway. Shoot, we thought, we're singing too loud and disrupting people's studying. "Are you guys singing Hanukah songs?!" she exclaimed, "Can you sing some to me? I'm Jewish too!". Surprised, we turned to her and sang our songs again for her. She was ecstatic - "I love those songs! Thank you so much!" (it must have been our melodious and perfectly harmonious voices). Then she told us that we had to go to the end of the hall and sing to the girl who lived there - she was Jewish and she would love it. So we went to the end of the hall and performed again, garnering smiles and laughs from the Jewish girl who lived there and her Asian roommate, and the whole bunch of people who had gathered in the hallway to hear us too. So we started making our way around the Quad - going from the room of someone we knew to the next room to which they directed us, stopping along the way for requests from Jews (presumably non-religious ones, as we didn't know them). Going down one hallway, these two big guys who were either in a frat or were soon going to be in one asked us to come into their room. We went inside and saw they had an iChat video screen open - one of them wanted us to sing our Chanukah songs for his girlfriend. After doing so, they took out a box of cookies - the other guys said that his mom had send them to him for Hanukah and he wanted to share them with us. "And don't worry", he added, "they're Kosher", showing us the symbol on the packaging. I took but didn't end up eating the cookie, saving it (until Pesach) for the symbolic memories it evoked - how we spent one evening on the eve of finals spreading some good old Jewish holiday cheer among some freshmen. What was most surprising was how excited people were to hear us sing - and truth be told, we didn't sound all that great - and on their own volition. Not once did we have to trick someone or force someone into doing something Jewish, we just walked down the halls singing Chanukah songs and people came to us. A few weeks earlier, with preparations for Chanukah on campus underway, the issue came up regarding Candle lighting. Lighting should be done in the residential arena, and as candles are forbidden in dorm rooms, the OCP always arranges for a table in the lobby of Rodin (where many Orthodox students, myself included reside) whereat residents could light candies. This had gone on for a few years and was a great idea, allowing for safe and halachik candle lighting and the chance for the many students to light in one unified, communal place - quite a beautiful sight. What it also did was allow the candles to be in a public place, fulfilling the aspect of pirsum hanes (publicizing the miracle) which we find by Chanukah candles. But what came to my attention (I'm still not even sure how I got involved in all this) was that this only happens at Rodin, leaving the other 10 college houses without organized candle lighting. So what normally happens? The handful of kids who actually care either light in their rooms on tin foil, or people light in Hillel, or people just don't light. What I've come to see is that if you don't give people the opportunity, they often won't make it for themselves. So I was put in charge of setting up candle lighting stations at the other college houses. I started speaking with residents of these different dorm buildings, finding suitable places, arranging meetings with house deans and getting things organized. By the end, we (it mostly the other students, I just oversaw) had arranged for tables to be set up at 7 different college house. While this was started for the few religious students who lived in these houses, we figured there might be more people who would want to light, and we also arranged to put out extra menorahs and candles. There wasn't much advertising, save for some word of mouth, and one guy made a Facebook group. And then it was Chanukah. The first night I went to one of the dorms, Hill house, to see how it would turn out. In the building of a few hundred residents, there were 3 religious kids who otherwise would've lit on their own, and probably a hundred or so Jews who... I dunno, maybe they would've lit in their rooms or in Hillel, but likely not. That night over 80 people came to light candles! 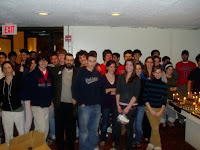 Granted, Chabad also brought some latkes and some of their own crew to hype it up, but 80 people! And the rest of Chanukah, over 30 people lit candles at Hill house every night! Reports came back of 10, 20, 30 people at the other stations! I couldn't believe what was going on! A few other nights I went around with some friends and some instruments (guitar, saxophone, djambe) to provide some musical accompaniment to the arranged locations. One house, duBois, known for housing a lot of African-Americans, happened to have three Jewish students and one of them arranged for a candle lighting table by the entranceway. We showed up there, and put on a mini-concert in the lobby - the three students, as well as everyone passing by, loved it! Running in between college houses with instruments over our shoulders and smiles on our faces, we were having the best time. And best of all, we were sharing the joy and happiness of Chanukah with dozens of others! Then finals came, I buckled down and studied, and soon it was all over. Then it was winter break, over which I thought a lot about these Chanukah experiences, about how people were so happy to get involved in something Jewish, and how rewarding it was to share it with others. After a lot of thinking and talking, I decided I had to do more of this, and I had to make this bigger. Back in school, during halftime of Super Bowl Sunday, I got together a bunch of 15 friends who had expressed similar interests and thoughts. We talked about these ideas and some potential projects - the first of which were 'kiddush in the Quad' and 'Shabbat meals'. People were excited, plans were laid, and the rest became history.